Peru's ex-President Alberto Fujimori has been cleared of corruption in a case relating to a 1994 arms purchase. 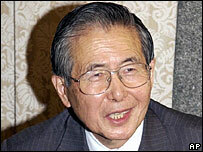 Mr Fujimori - who is in self-imposed exile in Japan - has said he intends to run for the presidency in 2006. Mr Fujimori faces more than 20 other criminal charges. His lawyers are trying to get all the outstanding court proceedings against him dismissed. On return he faces arrest on charges of human rights abuses and corruption. Mr Fujimori denies any wrongdoing. He has been accused of involvement in the killing of 25 suspected members of the Shining Path guerrilla group by death squads, and also of misusing public funds. The South American country has also banned him from office until 2010 and has requested his extradition, which has so far been refused by the Japanese authorities. However, he has repeatedly vowed to return to the country and believes he can win next year's election. Mr Fujimori fled Peru five years ago after his government was embroiled in a corruption scandal. He was given Japanese citizenship because his parents were originally from Japan.